Danish Army Specific: The Zephyr was besides normal duties, used as a drivers training vehicle. Historical: Ford introduced a new Zephyr/Zodiac range in April 1966 to replace the Mk III range. Once again the "base" four cylinder model was the Zephyr 4, although a new 1996cc V4 engine replaced the old in-line engine. The Zephyr 4 now came with the option of either a floor or column mounted manual gearchange as well as an automatic as option. The Zephyr used a new bodyshell which had very bold US influenced styling and featured an enormous bonnet and a blanked grille panel. The range also used all-round disc brakes and fully independent suspension, quite a development on ordinary cars in 1966. Unfortunately the Mk IV range suffered with corrosion problems and the V4 developed a troublesome reputation. 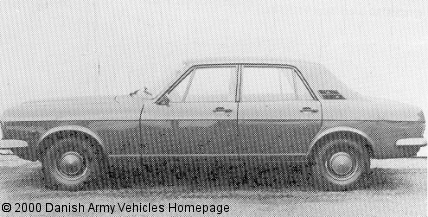 Production of the Mk IV Zephyr/Zodiac stopped in 1972, when it was replaced by the new Consul/Granada range. Engine: Own V4-cylinder, 1.996 cm3 (121 cubic inches). Horsepower: 88 at 4.750 rpm.